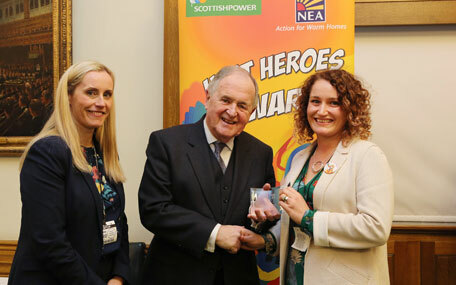 Emma Pagett from Arun and Chichester Wellbeing was named a Heat Hero at a special awards ceremony at the Houses of Parliament this week. The Heat Heroes Awards, are open to individuals across England and Wales and celebrate those who go above and beyond to get the recognition they deserve - for helping people in their community live in warmer homes. Held in partnership between ScottishPower and the charity National Energy Action, this year there were some very strong candidates, but the judges managed to select fifteen worthy winners. Not-for-profit organisations including local authorities, health and social care agencies, voluntary and statutory agencies and community groups were encouraged to nominate staff and volunteers for the award. Maria Wardrobe, Director of Communications and External Relations at National Energy Action commented: "Each year I am bowled over by the passion and tenacity that our Heat Heroes demonstrate, always going above and beyond what is expected of them in their job or as unpaid volunteers. It was a delight to meet them and be able to say well done and thank you on behalf of those they help." Gillian Noble, Sales Director at ScottishPower said "ScottishPower is delighted to be sponsoring the Heat Heroes Awards for the sixth year. The hard work and commitment shown by these dedicated people within their communities is crucially important in helping to tackle fuel poverty. On behalf of ScottishPower I'd like to congratulate all the nominees and winners." The winners were shining examples to others in their communities; here is what Councillor Mike Clayden, Arun District Council Cabinet Member for Community Wellbeing said about Emma. "I am very proud of Emma, who, along with colleague Jo Williamson, has worked hard to provide much-needed support to some of our most vulnerable residents. The feedback we have received from residents shows just how much of a difference Emma has made to their lives. We are all grateful for Emma's hard work and the award is well deserved." "I'd like to say congratulations to Emma for her award, and all the hard work that both she and Jo do to support and improve the lives of residents in our district," says Councillor Eileen Lintill, Cabinet Member for Community Services at Chichester District Council. "Having a warm home is vital for health and wellbeing and I know that their work has made a tremendous difference to a number of our residents." West Sussex Wellbeing, which is a partnership between each district and borough Council and West Sussex County Council, works with members of the public and organisations, providing a range of programmes to help people lead a healthier lifestyle and reduce their risk of developing cardiovascular disease, diabetes type 2, stroke and preventable cancers. Initiatives available through Arun Wellbeing include individual support for residents, WISE (Weight Information Sensible Eating - a weight management course), Pre-Diabetes courses, Wellbeing in the Workplace and in the Home, Cook and Eat, the Family Wellbeing programme and beginners' fitness and falls prevention courses. The Family Wellbeing programme is offered by both Arun Wellbeing and Chichester Wellbeing working with families to promote a healthy lifestyle and good nutrition.